At the denim shop, they are currently offering denim with free shipping and returns. Conditions apply and may be for a limited time. 1. 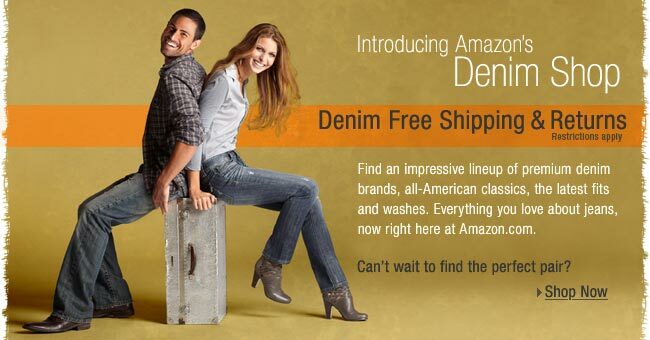 Place any pair(s) of men's or women's denim jeans sold by Amazon.com in the Amazon Denim Store in your shopping cart. When you are finished shopping, click the "Proceed to Checkout" button. 2. Ship these items to a single address. 3. Select Free Super Saver Shipping. 4. Enjoy Free Super Saver Shipping in 5-9 business days on the qualifying product shipped to your specified address. 1. If you are not satisfied with your purchase, return the new, unworn qualifying product within 30 days of delivery for a full refund. 2. Just visit our online Returns Center at www.amazon.com/returns and we will guide you through the process and even supply you with a prepaid return mailing label you can print out. 3. Amazon will process your return and issue a full refund for the qualifying product with no deduction for shipping after receiving your return of the new, unworn qualifying product. If you do not purchase the qualifying items added to your Shopping Cart when the free shipping promotion is in effect, you may not receive Free Super Saver Shipping and Free Returns on Jeans. The free shipping promotion applies only to qualifying items purchased from the seller indicated in the offer message. It does not apply to the same products sold by other sellers. For example, if the promotion applies to cookware offered by Amazon.com, the same cookware offered by other sellers on the Amazon.com website (e.g. Macy's, Target, etc.) do not qualify. The free shipping promotion applies only to orders shipped via Free Super Saver Shipping to a single address. Free Shipping applies to U.S. delivery addresses in the 50 states only, including Alaska and Hawaii. Applies to APO/FPO addresses when using a United States ZIP Code only. Free Shipping does not apply to orders placed with 1-Click. View more conditions at the Amazon.com site.